High Tech pleased to offer Mitas Electronics products and services! Mitas Electronics specializes in designing, developing, manufacturing and/or sources custom microcoaxial cable assemblies for electronic LCD panels and related industries. Our core competency is in terminating fine pitch connectors as small as 0.3mm pitch to micro coaxial (MCX) or discrete wire in the 42 AWG size and less. We also source most cable assembly technologies including but not limited to: LVDS (VESA compliant CCFL and LED Backlight), Display Port (eDP), SAS, SATA, HDMI, USB, CATx, ect. Our solutions provide assistance to our customers from the development laboratory to mass production. LCD panel cabling is our core business and we terminate the top brand connectors such as I-PEX, Hirose and JAE to produce cables for all brands of LCD panels including Samsung, LLG Electronics, Sony, Sharp, Toshiba, AUO, Chi Mei Innolux (CMI previously CMO) and Hydis and many more. Mitas's micro-coaxial (MCX) custom cable assemblies are precision engineered to provide superior flexibility and reliability for use in military and medical equipment, high-end automated video test equipment ( e.g. Display Port), and security applications. In addition, MCX cables are being used at an accelerated rate as wiring components in display applications such as in PC notebooks, LCD’s, FPD’s, PDA’s, Digital Video Cameras and cellular phones. The support of flexible and reliable circuitry, combined with the best technology to deliver controlled impedance, high frequency and geometry choices, makes MCX cable assemblies a popular choice for use in lightweight, mobile consumer electronics. Small diameter and lightweight for easy routing. Excellent heat resistance and electrical properties. Superior mechanical strength and flex life characteristics. High purity copper alloy constructions. Available sizes between 32 and 48 AWG. UL approved and ROHS compliant. Mitas RF cable assemblies are the ultimate solution for all your RF needs. Manufactured in our ISO 9000 registered manufacturing facilities, Mitas RF cables are constructed with the highest quality connectors and bulk cable from the worlds best manufactureres to ensure maximum signal transfer. Our cables offer the best in RFI and EMI shielding technology utilizing high-density copper braids and 100% foil shielding to deliver the highest protection level possible. In addition, our state-of-the-art manufacturing facilities ensure that our cables exceed future requirements. At Mitas, it is our goal to provide you with the advantage you need to serve your customers. Available with multiple connector options including SMA, BNC, N, F, MCX and MMCX. Precision impedance control for 50, 75, and 90W applications. High-density copper braids and foil shielding for minimum RF and EM interference. Quick turnaround and low cost. Perfect for Radio, CATV, satellite, and other telecommunication applications, Mitas RF cables come in virtually any length and with a wide choice of connectors including SMA, BNC, N, F, MCX, and MMCX. Built with high quality dielectrics, our cables provide minimum signal attenuation and maximum signal transfer even over long cable runs. Our ultra durable PVC/PE jackets protect each cable in even the harshest environments. at the 2016 Commercial Sales Conference in Irvine CA. 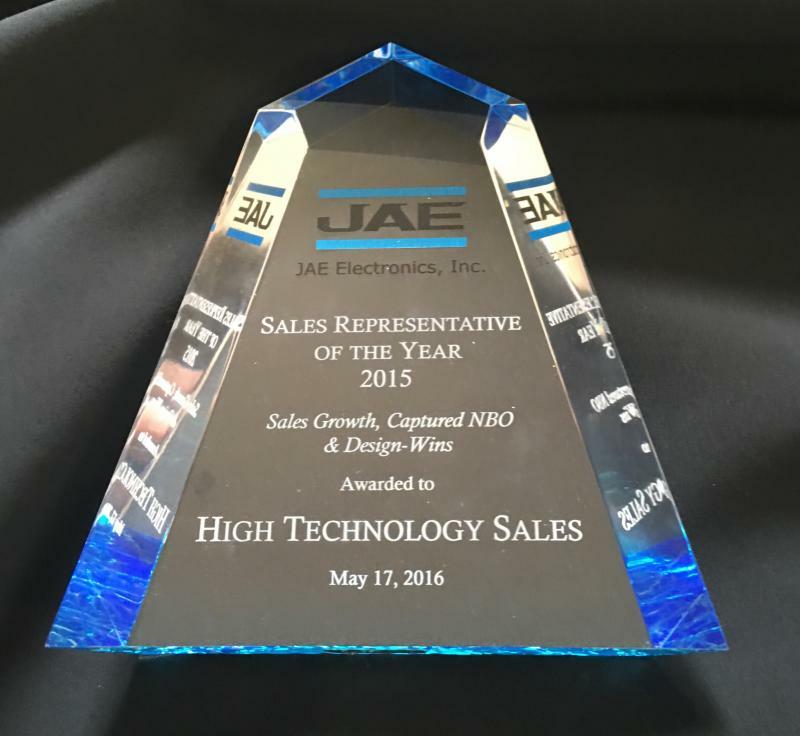 The award is based on sales growth, and design win performance. HD video, LCD Displays, LED lighting and avionics. Contact High Technology Sales for your connector requirements!